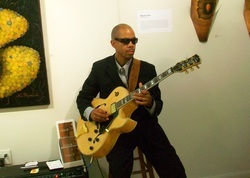 Deon CleanCutt, a multi-instrumentalist, is a highly proficient guitarist, bassist, producer and composer from Washington, District of Columbia. This distinguished musician has made his mark in the Washington D.C. metropolitan area and the region, as the ‘go-to’ jazz guitarist who can accelerate any musical style. He is sought after for his artistic expression on guitar and bass, as well as his pleasing personality; appealing in all settings and genres. Deon has released three independent studio albums that are appreciated worldwide as illustrated via his offerings on-line (cdbaby, sonicbids, etc.). The first CD, entitled "CleanCutt", is comprised of 10 original compositions. One selection, "Your World", received the Honorable Mention award in a nationwide song contest hosted by the Song Writers Association of Washington and has captured the attention of many music critics. The second CD, "I Like It", was released in November 2005 and has sparked national and international acclaim as it showcases the mastery of his composition, arrangement and production capabilities. His third and most recent CD "3rd Round" was released April 21, 2012 and illustrates his astute study and accomplished diversity in all styles of jazz music. It also pays homage to his early career in boxing where he won local, regional, national and U. S. Army championships. The combination of intense boxing and musical training, along with the study of all types of music gave birth to a new awareness and a deeper, more profound understanding of one's own ability to exceed normal limits. This has resulted in a greater appreciation for the power of music and its positive effect on everyday life - combining the mental, spiritual and physical forces into his performances. Deon, a versatile and dynamic performer, has performed as a headliner and as an in-demand sideman at the U.S. Capitol, Caesar's Palace, Blues Alley, The Kennedy Center, other venues and numerous jazz festivals. In a 2015 feature by CBS, of The Sanctuaries, Washington DC, he was spotted on bass! Even though Jazz continues to be his favorite, he has performed in many genres of music – Rock, Rock Musical, R&B, Oldies, Country, Classical, Go-Go, Reggae, Folk, New School and Old School. Additionally, Deon has written and performed the theme music to Red Astor's Cooking video, where he performed live on four different segments. He also wrote and performed the soundtrack for the "Sunshine Show", a long running D.C. cable program. Deon was highlighted on 2 episodes of African American Lifestyle television. Between the years 2002 - 2009 Deon produced ten (10) CD's for various artists (Debra Williams Garner, Marsha Meekins, M.U.I.. etc.) where he not only arranged the music but played guitar, trumpet and bass on many of the recordings; illustrating his versatility and production skills. Deon is also featured, collaborating with other musicians on their CD projects. Born into a musical family, Deon CleanCutt continuously studies music on a spiritual level to reflect and ponder on the harmony of life. This synthesis creates Deon CleanCutt’s unique, articulate style that is soulful, melodic, tasteful and pleasing to the ear. Deon is a member of the Songwriter's Association of Washington (SAW), The Washington Area Music Association (WAMA), DC Blues Society and ASCAP. ​His music can be purchased on his website - www.deoncleancutt.com, www.cdbaby.com, www.amazon.com and www.itunes.com. ​He can be reached at DeonCleancutt@aol.com for bookings.